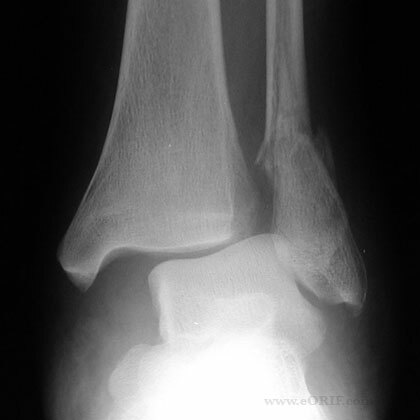 Syndesmosis instability after fixation of associated fractures. Syndesmotic injury with diastasis or instability. Syndesmotic injury without diastasis or instability. 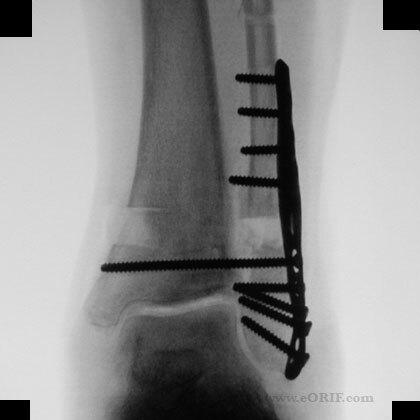 Fixation can be provided with two tricortical 3.5-mm screws or a 4.5-mm polylactide bioabsorbable screw, a 4.5mm stainless steel screw, or Arthrex tightrope fixation. Tightrope fixation may have faster recovery without need for removal, ong term outcomes studies are currently lacking. Consider the degree of instability and the size of the fibula when selecting screw size and determining the number of cortices engaged. 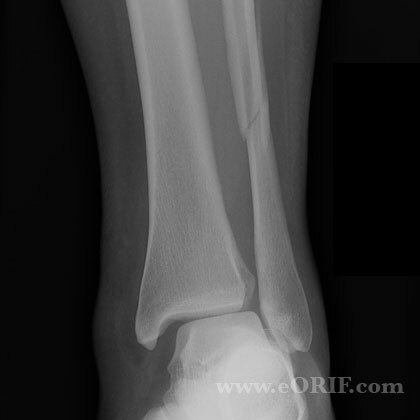 For high fibula fractures consider ORIF of the fibula to aid in determining proper rotation and length during syndesmotic fixation. Position the ankle in neutral. (Ankle position is controversial). Reduce syndesmosis with a periarticular reduction forceps, if needed, do not overtighten. 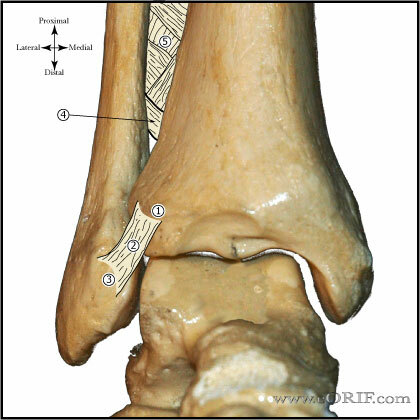 Centered drill on the fibula to avoid fracture. Consider Arthrex Tightrope technique, Wright Medical Gravity Synchfix or Biomet toggleloc devices. 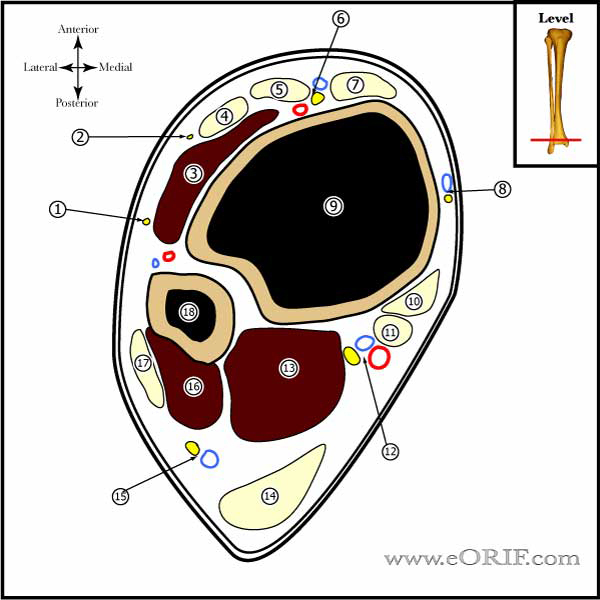 Drill tricortical or quadcortical hole using standard AO technique 2-4cm proximal and parallel to the ankle joint in the coronal plane. In the transverse plane, aim 25° to 30° obliquely from posterolateral to anteromedial because the fibula is located posterior to the tibia. Place 4.5mm stainless steel, fully threaded screw using AO technique securing the syndesmosis. Do not insert screw in lag fashion. Post-op: place in NWB Bulky-Jones dressing with posterior mold and side splints. 7-10 Days: Wound check. Place in NWB cast. 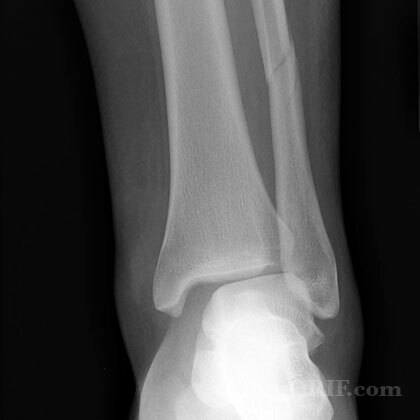 6 Weeks: Cast removed, check xrays. Place in Cam-walker with slow progression to full weight bearing. Discontinue cam-walker if pain free after 4 weeks. 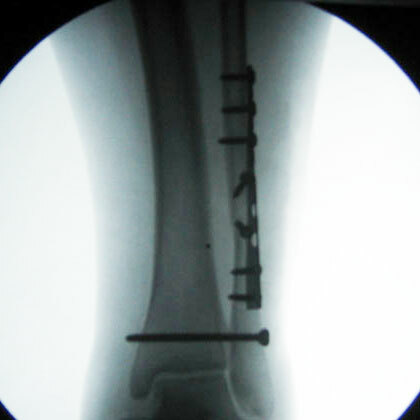 3 Months: schedule for syndesmotic screw removal to be done 12weeks after placement. Outcome is dependent on adequacy of reduction of the syndesmosis. (Weening B, JOT 2005; 19: 102). See also Ankle Foot Outcome Measures.